All hot springs can be fully exposed to effect of various hot springs in bath flowing constantly from the source. Dishes have local nature material and can taste local cuisine which is kind to body. 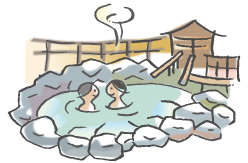 In early nostalgic atmosphere of the Showa era, we can enjoy hot spring cure. It is here Hijiori that person to take a walk through with jinrikisha and yukata, such a good old retro feeling drift at hot-spring hotel standing in a row in a row across alley. Other than atmospheric inn, there are three public bathhouses and spring water drinking place, medical treatment counselor's office, and it is understood that it is popular by bather. It is morning market that wants to recommend by all means as well as hot spring. You should be able to be surely satisfied with vegetables and mushrooms of products of the district, freshness, quantity, price including pickle. Do you not have a feeling that you seem to be used from body beautifully if you spend time for a while here?